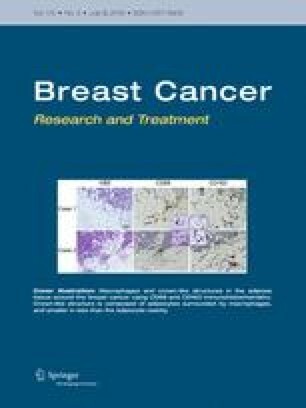 We have reported a survival benefit of single injection of hydroxyprogesterone prior to surgery for primary tumour in patients with node-positive operable breast cancer. Hydroxyprogesterone was meant to recapitulate the luteal phase of menstrual cycle in these women. We wanted to understand the molecular basis of action of hydroxyprogesterone on primary breast tumours in a peri-operative setting. We performed whole transcriptome sequencing (RNA-Seq) of primary breast tumour samples collected from patients before and after hydroxyprogesterone exposure and controls. Paired breast cancer samples were obtained from patients who were given hydroxyprogesterone before surgery and a group of patients who were subjected to only surgery. A test of significance between the two groups revealed 207 significantly altered genes, after correction for multiple hypothesis testing. We found significantly contrasting gene expression patterns in exposed versus unexposed groups; 142 genes were up-regulated post-surgery among exposed patients, and down-regulated post-surgery among unexposed patients. Significantly enriched pathways included genes that respond to progesterone, cellular stress, nonsense-mediated decay of proteins and negative regulation of inflammatory response. These results suggest that cellular stress is modulated by hydroxyprogesterone. Network analysis revealed that UBC, a mediator of stress response, to be a major node to which many of the significantly altered genes connect. Our study suggests that pre-operative exposure to progesterone favourably modulates the effect of surgical stress, and this might underlie its beneficial effect when administered prior to surgery. The online version of this article ( https://doi.org/10.1007/s10549-018-4749-3) contains supplementary material, which is available to authorized users. Authors would like to acknowledge Ms. Sriparna Biswas, Dr. Subrata Patra and Mr. Sumanta Sarkar for their help in performing the RNA-Seq laboratory experiments. We would like to thank Prof. Bidyut Roy, Mr. Badal De and Ms. Anindita Ray for helping in qPCR experiments. We would also like to thank Drs Nita Nair, Shalaka Joshi, Vani Parmar, Rohini Hawaldar and Vaibhav Vanmali for sample acquisition. PP, PPM, RAB and SG conceived, designed and executed the study. RAB, RC, NG, AD and SG provided clinical samples for the study. SC and AM generated RNA-Seq data. SC, PP and PPM performed RNA-Seq data analysis. SC, RC, NG, AM, AD, PP, SG and PPM interpreted the results. SC, RC, NG, AD, SG, RAB, PPM and PP participated in writing of manuscript. Authors acknowledge funding support from Department of Atomic Energy and Tata Memorial Centre for conducting the study. SC would like to acknowledge Indian Council for Medical Research for her doctoral research fellowship. RC is supported by a research fellowship from the Homi Bhabha National Institute (HBNI), Tata Memorial Centre. NG is supported by Prime Minister’s Fellowship Scheme for Doctoral Research, a public–private partnership between Science and Engineering Research Board (SERB), Department of Science and Technology, Government of India and Confederation of Indian Industry (CII). PPM was supported by the J. C. Bose Fellowship of the Government of India, Department of Science and Technology. This study was approved by the Institutional Ethics Committees of the Tata Memorial Centre, Mumbai, and the National Institute of Biomedical Genomics, Kalyani. Biospecimens were collected from breast cancer patients with written informed consent.